UK demand for tool vending and efficient tool management systems is on the increase, says Quickgrind, following a noticeable rise in sales of its QuickVendtool vending solution. 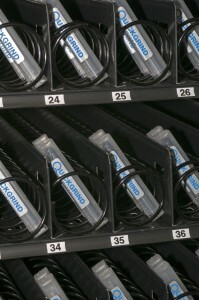 “Having highlighted our QuickVend tool management system at Southern Manufacturing 2015, we have seen an increase in sales,” comments Quickgrind’s Managing Director Ross Howell.“Businesses are clearly recognising the benefit of using a vending system for secure tool storage and dispensing at the point of use. Ross’s comments are backed by a recent survey by the manufacturers’ organisation EEF which showed that one in six manufacturers have already brought back some elements of their activity to the UK. This is music to Quickgrind’s ears as champions of high-quality British engineering and fast, efficient service. Another key factor is the continuing need for companies to cut costs while simultaneously improving performance, in order to respond to an increasingly competitive global market. A perfect example of this is the energy sector, where businesses are having to tighten their belts in the wake of falling oil prices. He continues, “With QuickVend, there is no need to tie up company cash in tool stocks or to carry out the related – and often frustrating – forecasting, auditing and managing. Intelligent software monitors and reports on who is using what tools, and in what numbers. Each item is replaced by Quickgrind, before it is required, and the customer pays nothing for a tool until it is dispensed. For further information on Quickgrind, its QuickVend tool management system and its unique approach to tooling, visit www.quickgrind.com.